Girl Scouts of Wisconsin Southeast's Camp Alice Chester (CAC) on picturesque Booth Lake first opened its doors in 1924 after a successful fundraising effort led by Alice Chester, the first president of the Milwaukee Girl Scouts. Thousands have walked its well-worn trails, cooked over campfires, and slept in the tents and cabins. Swimming and boating activities have consistently been a major appeal for campers. The historic European-style lodge has provided a gathering place for community meals, folk dancing, dramatics, arts and crafts, and ceremonies through the decades. CAC is a unique setting where skills and confidence are strengthened and lasting friendships are formed. Since the fall of 1980, CAC has also been known as Alice Chester Center (ACC). The name change brought expanded year-round, staff-led opportunities for Girl Scouts and others to utilize it during the fall, winter, and spring seasons. Today, the accredited property encompasses 333 acres and features frontage on two lakes. Author Jean Krieg was a CAC camper in 1970, 1971, and 1972 and a counselor in 1980. As it is for others, CAC is a source of rich memories for her. 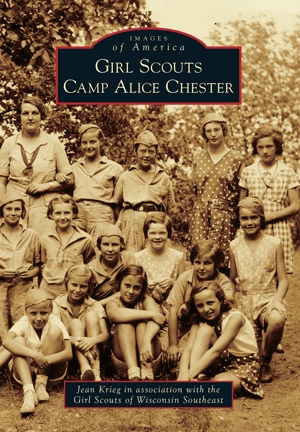 Photographs featured in Images of America: Girl Scouts Camp Alice Chester were obtained from the Girl Scouts of Wisconsin Southeast and the collections of campers and staff.